In response to the increasing demand for cost-effective access to technical experts, the outsourced IT services industry is growing rapidly. According to a study by Sourcing Line Computer Economics, the IT sector is second only to manufacturing in terms of the percentage of US companies currently outsourcing. Outsourcing IT functions allows organizations to remain competitive in today’s marketplace. The need for constant, leading innovation, cost concerns, and recruitment challenges in today’s war for technical talent lead many organizations to seek cost-effective solutions with experts outside of their organizations – often across the globe. The goal of these IT outsourcing arrangements is to build a mutually beneficial partnership where the teams are aligned, and the outsourced team enables and supports the business team’s growth through consistent delivery of excellent results. The task of leading a remote, culturally diverse team requires a much different skill set than traditional on-site team management. Too often, organizations transition from in-house IT employment to outsourcing arrangements without any specialized vendor management training for the remaining managers. The ability to build strong relationships is key to long-term partnership success in an outsourced IT arrangement. This need is both more critical and more difficult when team members are geographically dispersed and face-to-face time is limited. A very common challenge within IT outsourcing partnerships is a tendency for the business team to intervene and “fix” issues without giving the vendor the opportunity to develop their own expert solutions. This is often due to confusion regarding where responsibilities and accountability lie – is the business team ultimately accountable for project success? Is the outsourced team accountable? A disconnect of this manner can lead to project failures, duplicated work, and frustrations within both teams. A large barrier to success in IT outsourced partnerships revolves around the communication challenges experienced among the teams due to differences in cultural communication styles. In the United States, we tend to demonstrate low context cultural communication, which often differs from the communication styles of our IT partners’ cultures. For example, many IT teams are based in Asian nations, which tend to have high context cultural communication styles. The success of a partnership depends on both teams’ ability to communicate clearly and to ensure mutual understanding. 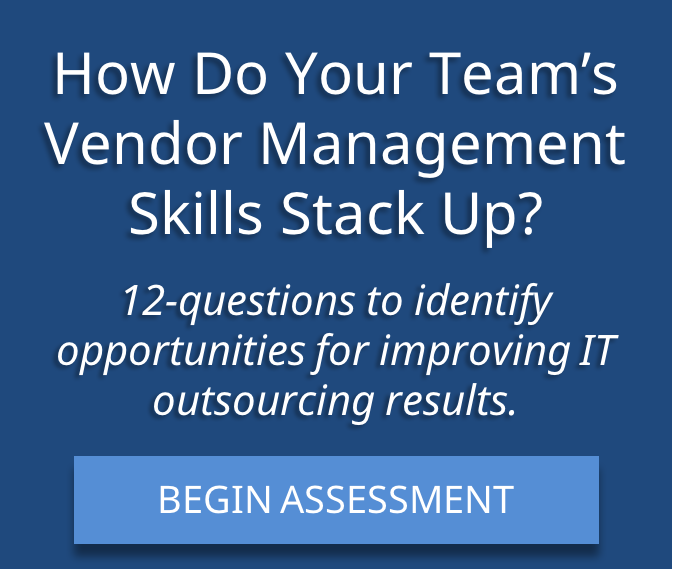 Do you outsource your IT function? What challenges have you encountered in maintaining engagement and alignment among the teams?